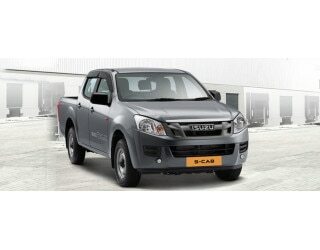 Feb 5, 2019: The Isuzu D-Max S-Cab is the double cabin variant of the standard D-Max. It has a D+4 seating layout and air-conditioning is offered as a standard fitment. The cabin also has a tiltable power steering and an adjustable seat for the driver. The Isuzu D-Max S-Cab gets hydraulic brakes while the suspension is done over double wishbone for the front and semi-elliptical leaf springs for the rear. Under the hood, the double cab pickup truck is powered by a 2.5-litre, 4-cylinder turbo diesel engine that can produce 78 bhp of power and 176 Nm of torque. The generated power is sent down to the wheels via a 5-speed manual gearbox unit. It has a gross vehicle weight of 2.7 tonnes, out of which, the maximum payload capacity is of one tonne.